Planning ahead for a fabulous family ski vacation. The most important aspect of skiing with the family is planning. It’s not just the logistics of taking your kids and all of the gear you need to the ski slopes. It’s just as crucial to choose the right ski resort and the right activities, so your family ski trip is fun for everyone— grown-ups and kids alike. Before you book a vacation at an expensive ski destination, consider a day trip or ski weekend. That way you’ll get the skiing experience without spending a fortune. Ski resorts that are geared toward the beginning skier are prevalent in the Northeast. Look for a resort with a beginner ski area. The resort should have a slow, easy means of transport to the top of the learning hill and a package deal that includes a lift ticket on the learning area, as well as rental equipment and a lesson in a guaranteed small group. Nationwide, top ski resorts for family activities include Aspen/Snowmass in Colorado, Smugglers’ Notch in Vermont and Whitefish in Montana. Park City, Utah, and the Lake Tahoe area are good hub areas where you can venture to more than one family-friendly resort. If your kids are younger than school age, consider taking your trip during a non-holiday week. The mountain and surrounding area shouldn’t be crowded, and there may be additional savings for mid-week visitors. At all of these resorts, you can book family ski and stay packages, which typically feature free or discounted children’s lift tickets, with an adult purchase, along with free lodging for children. Some meals are often included, too. Many ski areas also offer packages with daily lessons and complimentary rental equipment. Is the ski resort child-friendly? Does the resort have a learn-to-ski program? Is there a beginner slope? Can you rent ski equipment? Hunter Mountain, Killington, Smugglers’ Notch, Whiteface Mountain and Bretton Woods are all within driving distance of the New York area, making ideal weekend trips. Google the locales to learn about their family and children’s activities, both on and off the mountain. Dressing your child appropriately is essential to having a good ski experience. Cold fingers or toes can ruin a ski day, regardless of how old you are. Invest in good quality ski jackets and ski pants, long underwear, ski socks and ski gloves. Also confirm that your child is wearing the correct safety accessories. A helmet is necessary for your child— even if he is on the beginner slope! Check to see if you can rent a helmet along with skis, boots and poles. Otherwise, invest in a helmet when you’re buying ski clothes. When booking lodging, check to see if the ski resort has slope-side condominiums available. A condo is perfect for a family ski vacation. Most ski areas have condos with two or three bedrooms, a kitchen and a dining room or dining area, meaning you don’t have to spend time— and money— eating every meal in a restaurant. Another good alternative is a suite with a kitchenette. Also, check on transportation. There may be a shuttle from the airport and another shuttle that gets you to the mountain and around town. In other words, you may not need to rent a car. If you have little ones, plan ahead. Review childcare options, and make your reservations well in advance. The Treehouse Kids’ Adventure Center at Snowmass, for example, has daycare, ski and snowboard programs, preteen, teen and family activities, plus entertainment, all under one roof. The center has an interactive crawling tunnel, the Aspen Climbing Room featuring a leaf-designed climbing wall that’s fully netted for safety, and a pretend miner’s cabin with built-in discovery areas. There is plenty for your children to do if they don’t want to ski a full day, and a full day of skiing is often too much for young children. Heavenly Mountain Resort in South Lake Tahoe has on-site childcare for children ages 6 weeks to 6 years. The resort has an impressive combination of ski terrain, activities and childcare programs. Don’t forget to plan a parents’ night out. Before your arrival, see if the resort can provide you with a list of approved babysitters, and book your sitter early, especially during peak ski season. Off-slope activities are necessary for people who want an alternative to skiing all day. Many resorts have a variety of activities for vacationers, such as tubing, snowshoeing, horse and carriage rides, dogsled rides, family movies and lots of other indoor and outdoor activities, ensuring your family ski vacation is packed with fun. 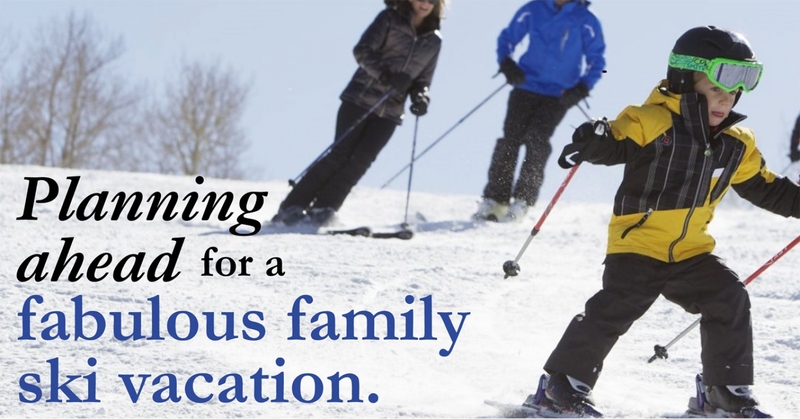 Whether your family has beginners or expert skiers, everyone can enjoy a ski resort vacation. And with a little advanced planning, the process can be as relaxed as a walk in the park— or a ride down the bunny slope.